I shot these pictures a couple of days ago at my old Prada standby—the SoHo store at Broadway and Prince Streets. 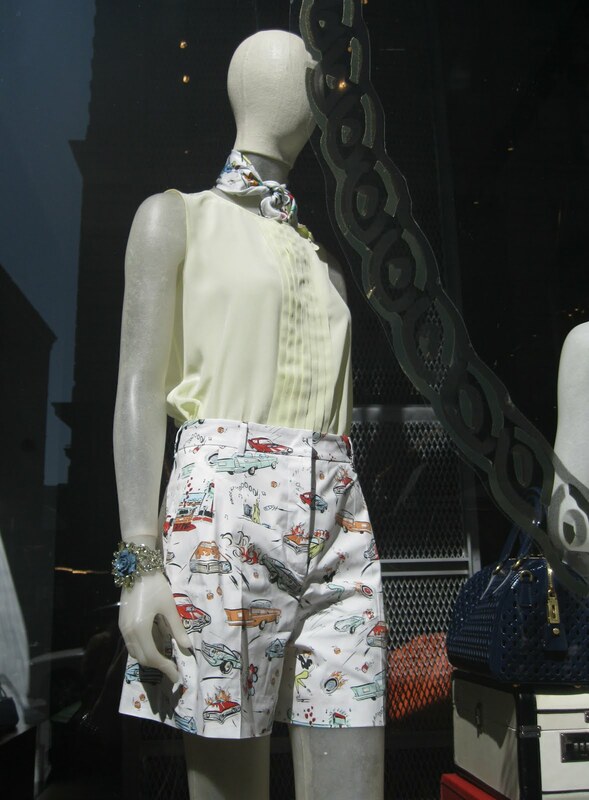 I really loved the hot rod print on the shorts—so 50s, so fun!—and the rose and crystal cuff is beyond. I was also loving the fire engine red tote even though it is so very large and open. It’s hard for me to turn down patent leather. Isn’t this blouse divine? I never get tired of eyelet, in all its many forms! Your intrepid photographer in the reflection, as well as her sweet daughter who will start kindergarten in September! She loves these purple-tinted sunglasses and gets smiles wherever she goes when she wears them. People also tell her she looks like Elton John, which makes me laugh every time. Your daughter is so darn cute! Love that big smile. If I had unlimited funds, I would make that blue patent Prada bag mine...but I don't so I will just admire it on your blog. 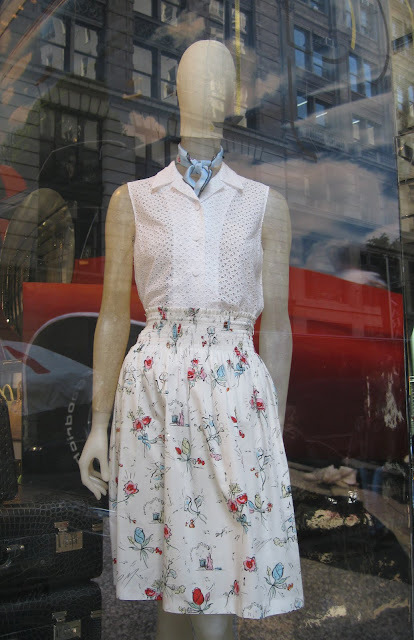 So many yummies--especially that eyelet blouse. That I might honestly stalk to see if it goes on sale. And the tote! Brilliant. I loved everything here..that cuff, and print are so much fun! Thanks for sharing...i love this! Window shopping Prada is all that I can afford so thank you for taking me along for the ride! That's one cute little assistant you've got there! I see you have a true fashionista with you, ahhhhhhhh love, love her and her purple glasses. I have been after alternative prints, away from the typical flowers, stripes, etc. And here comes Prada with what I have in my head, ahhhhhhhhhhhhhhhh. It's a treat to get a glimpse of your daughter. 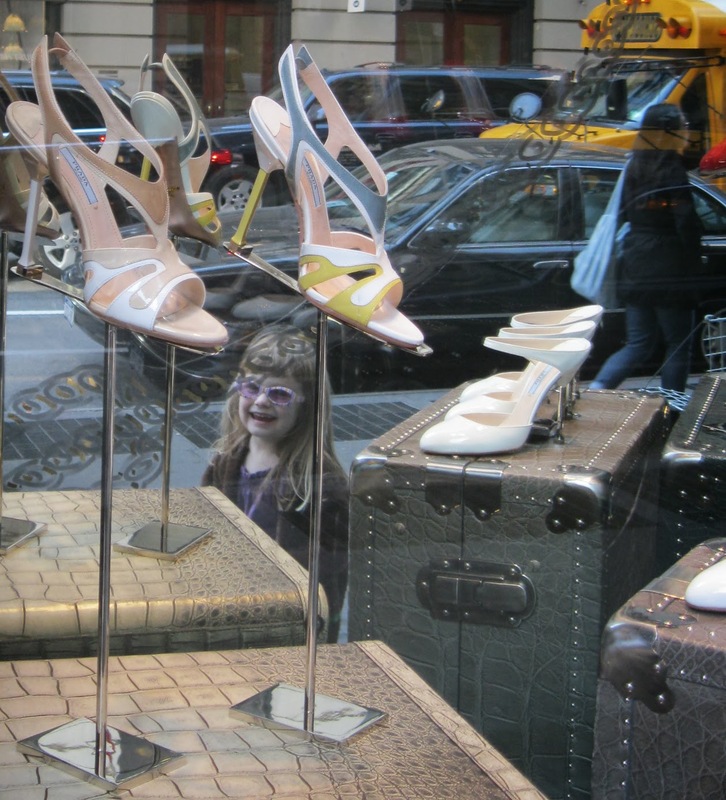 And I love your REAL window shopping posts. I would wear those shorts in a heart-beat, although with a brighter top. Hi Sacramento, I love my girl in those purple glasses too, they are hand-me-downs from a friend and she loved them right away! There's a reason why I love Prada, so fresh and original yet wearable- I love these outfits and that tote. And wha? Your baby girl is going to kindergarten? Soon it'll be college! I love her purple shades!